Your Philippine travel adventure would not be complete without seeing at least one of the Philippine festivals. There are over a hundred Cultural festivals in the Philippines – usually celebrating something to be thankful for. Philippine festivals are usually celebrated in thanksgiving for a wonderful event or as a commemoration of a patron saint’s day. No matter what the reason is, these festivals are always characterized with colourful parades, fun events, and lots of great food. There is literally one festival for every town in the country, since each town has a patron saint guiding them. Still, there are more popular ones that you should not miss on your Philippine travel tour. Here’s a list of the top ten most widely visited festivals in the Philippines. The ati-atihan festival is one of the wildest dance parade festivals in the Philippines. It is held every third Sunday of January at Kalibo, Aklan. The festival is done in honor of the Holy Infant Jesus. Catholics and non-Catholics alike celebrate this festival. During the festival, various parade groups covered in soot, wearing bright-colored costumes parade around town to lively beats. Baguio City is not only a popular Philippine travel destination, but it is also well-known for its beautiful flower festival. Held every February, the festival parades, dances, and various events last all month long, with the weekends being busier than the weekdays. During this month, the City of Pines showcases their beautiful flower floats and installation arts. More like a gathering than a festival, the Feast of the Black Nazarene is popular to Catholic devotees around the Philippines and the world. Held every 9th of January, people join the procession of the Black Nazarene statue around the areas of Quiapo, hoping to be able to touch the statue due to the belief that it would bring them prosperity and healing. During this time, the government is very wary of medical injuries caused by stampeding. Marinduque is one of the most popular places to visit during the Holy Week because of their unique festival. The Moriones is a festival portraying the search for Longinus. Longinus is said to have pierced the side of Christ. The blood that spurted out of Christ’s side touched Longinus’ blind eye and it healed him, causing him to be converted to Christianity. During the Moriones festival, people portray as Romans in colorful painted masks (called Morion) as they look for Longinus. In the story, Longinus is caught and beheaded for being a believer of Christ. Another Philippine travel attraction is the Higantes festival in Angono, Rizal. It is held every 22nd and 23rd of November in honor of their patron saint, San Clemente. The Higantes festival features giant caricatures of people made our of paper mache parading around town. If you want to see very colorful festivals during your Philippine travel, you could never go wrong with Maskara festival. Maskara means masks, and during this festival, colorful masks and costumes are paraded by dance groups. There are also fairs and carnivals. This festival happens every third week of October, usually the one closest to October 19. Filipinos like to give thanks. The Pahiyas festival is evidence of that. It is a festival done every 15th of May to thank San Isidro Labrador, the patron saint of farmers, for the bountiful harvest received that year. To commemorate this event, the people of Lucban, Quezon where it is celebrated decorate their houses with harvested goods and “kiping”, a colored rice-wafer. For the people of Leyte, a week of party and merrymaking is not enough. 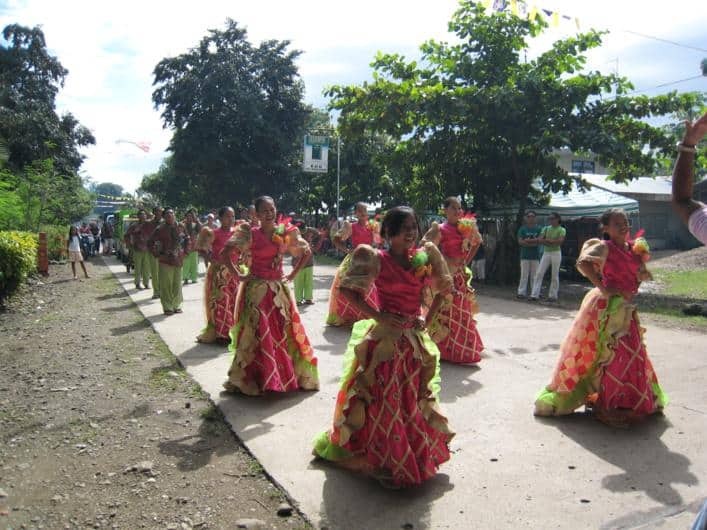 The Pintados festival is a month-long celebration that starts on the 29th of June. Several parades and dances happen during this month. The unique things about this festival is that people do tattoo and body art. It is quite a great attraction for art fanatics. One of the most popular food in the Philippines is Lechon, or roasted pork. In honor of St. John, Balayan, Batangas celebrates June 24 with a parade of these delicious port roasts, which is also the town’s specialty. Complete your Philippine travel adventure by attending one of these festivals. It will show you more of the Filipino culture and you would surely be welcomed with lots of laughter, dancing and celebration.